Good evening! The last miner was just pulled to surface in Chile – it just takes my breath away (and not in the Top Gun/Tom Cruise kind of way!). I’ve been glued to this story since the rescue began, and so glad to see a happy ending. Day 4 – Chicken Shawarma Cardamom + 9 other spices! 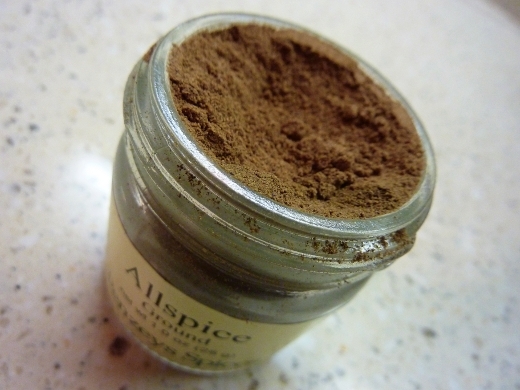 Today of course, was time for yet another of my new spices – Allspice. And not only a new spice, but this was also a new recipe, and further, a new food for me! 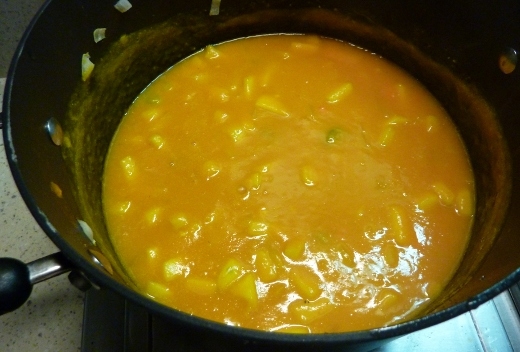 I made Butternut Squash Soup, which, even as a squash-lover, is something I’ve never tried before. I found an interesting recipe to try (click here to see the recipe), chock full of all sorts of ingredients, one of which was Allspice. At this point, it was time for the star ingredient to shine – four 12-ounce packages of frozen squash (very affordable and SO much easier than peeling/chopping a fresh butternut squash – though I do feel slightly guilty for not taking advantage of fresh seasonal produce). I attempted to defrost the squash by placing the packages in the fridge the night before, but they barely thawed, and it ended up being totally fine just throwing the frozen squash into the broth. 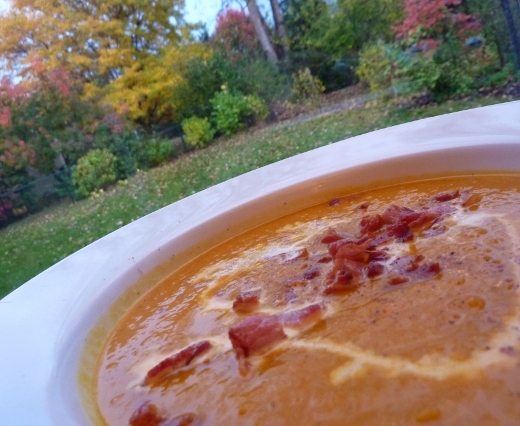 Once all the ingredients were all warm and “happy,” as Emeril might say, I let the soup simmer for about 20 minutes, filling my home with yummy fall aromas of squash (or maybe it was the bacon that smelled good! 😉 ). 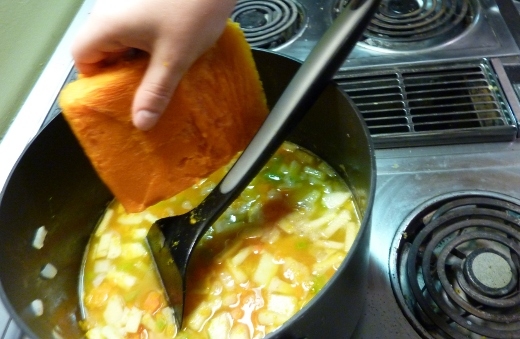 This is the point at which there is a chunk of missing documentation of the soup-making process – due to boiling-hot, liquefied butternut squash flying all over my kitchen and body, followed by lots of yelps. It wasn’t pretty. Luckily it wasn’t a large volume of squash. 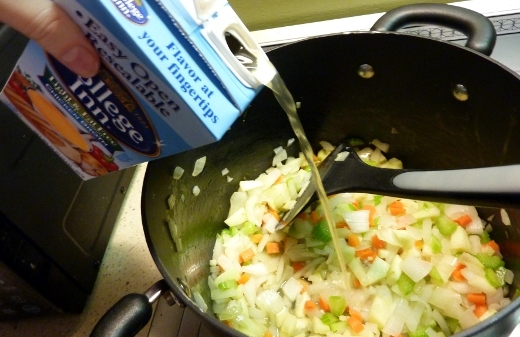 Basically what has to happen to your soup at this point is that you need to spoon it into your blender, in batches (that is KEY! SMALL batches kids, trust me, or your kitchen will look like mine 😉 ), to puree all your veggies and create a thick, luscious soup texture. 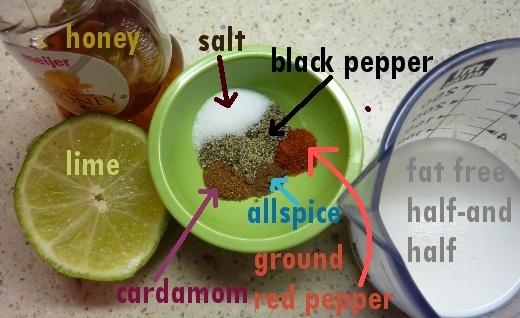 Once everything was blended and back in the pot, I added the following ingredients (including the spice of the day – Allspice!). Here is the final product, garnished with bacon and half-and-half. Gorgeous! Perfect for a fall day, amirite? At first I wasn’t sure I was a huge fan. 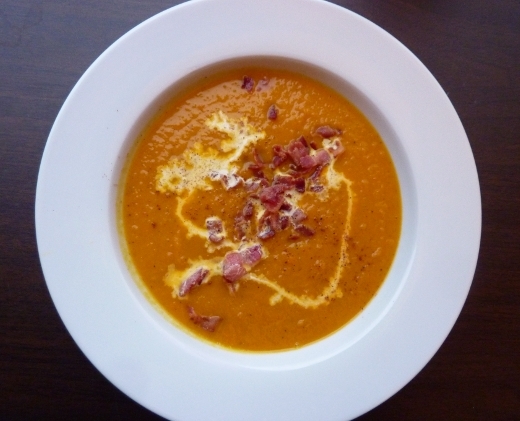 The flavor packed a PUNCH, from all the different ingredients, but with every additional bite I took, I loved this soup more and more. By the end I was raving! So scrumptious, and packed full of veggies. 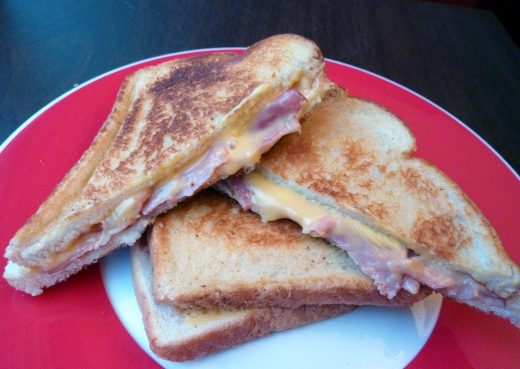 To accompany the soup, we had grilled ham & cheese-us. No cheese-us for us, but maybe a flying spaghetti monster on there somewhere. (I’m predicting that only a small fraction of my audience will understand that last sentence.) I must give credit where credit is due, and Tom must receive credit for assembling these sandwiches, before I grilled them up. Nice work T! Now I really want to watch Top Gun. ♪♫ Currently listening to: Take My Breath Away – Berlin.